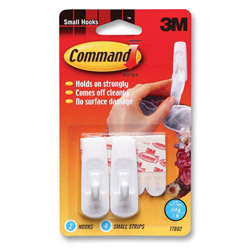 Command Small Hooks offer a mounting solution that holds firmly and removes cleanly. They leave no surface damage and are reusable. Each hook holds up to 1 lb. White Velcro and Fabric Grips from 3M! 79 In Stock today.